Gonzaga student Hannah Tolson will compete in next week's international collegiate world championships in Slovakia. It's a hot, spring afternoon during finals week at Gonzaga University when Hannah Tolson strolls into a coffee shop looking like any typical junior math major pushing toward the end of the school year. She's a little harried and carries an overstuffed backpack on her shoulder, a water bottle in one hand and cell phone in the other. She makes a beeline to the counter to caffeinate so she can cram for one last final the next morning. Her tank top and shorts showcase the strong, wiry frame that helps make Tolson far from typical, though. 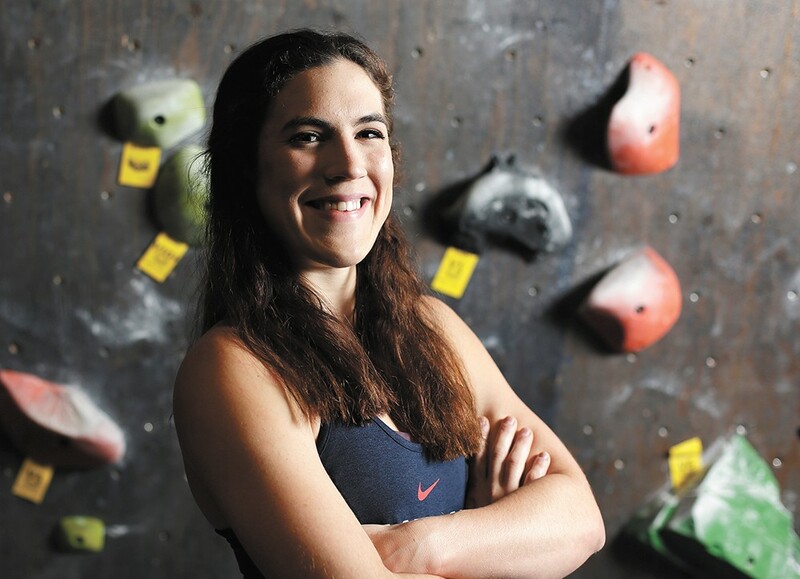 She's one of the country's best competitive climbers, finishing in the top five in three different climbing categories — sport-climbing, bouldering and speed-climbing — at this spring's U.S. collegiate championships. It's virtually unheard of for climbers to compete in all three styles, let alone do so well, and her performance made Tolson the only climber, male or female, to quality for next week's international collegiate world championships in Bratislava, Slovakia, in all three disciplines. Tolson attributes her love for attacking climbing walls to the complexity of the challenge. "Even though I was really weak [when I started], I loved problem-solving," Tolson says, describing her first visits to her local climbing gym when she was a "scrawny" adolescent. "Which is part of the reason I'm a math major, I think. I look at a puzzle and try to figure out how to solve it, and then execute. "Especially when you get into harder climbing, it's almost like this vertical chess match, where there's this really specific way you have to go, a specific sequence you have to follow if you want to get to the top ... A huge part of climbing is being able to look at a wall and say, 'OK, I know exactly which hand is supposed to go where, in what orientation and in what order, and where I'm supposed to put my feet.'" Tolson's route to the top of competitive climbing wasn't as direct as many of her peers. In fact, she describes her entry into competitive climbing as almost a lark — just a fun experience to see how she'd do after she got into the sport in middle school. "It's kind of like gymnastics; if you're not in it at a really early age, you've kind of missed the boat," Tolson says. "I always felt I had missed the boat a little bit because I was 13 by the time I started competing. I kind of haphazardly entered a competition just to see how it went." It went pretty damn good, because Tolson almost immediately started placing high in youth competitions. Her success led to climbing in bigger and bigger events at competitions further and further from home in Arizona. "Indoor climbing competition has gotten really crazy," says Tolson. It wasn't surprising that she was passionate about her high-flying pursuits, but it was perhaps surprising how quickly she became proficient, given that Tolson says she "was never much of an athlete." Her dad was a competitive soccer player, as was her brother, but "I'm just a terrible runner. So horrible. So clumsy. You can tell because I have an ankle brace on — I fell down the stairs last week! I have two left feet." That kept her from succeeding at traditional sports as a kid, Tolson says, "and that was kind of unfortunate because I had all this competitive energy and I didn't really have a way to harness it." Her middle school athletic director insisted students participate in something, so Tolson started on the list of "alternative sports for the less-traditional kids." She tried archery, but she was terrible. "But the next year I tried climbing, and I don't know, it just really stuck," Tolson says. "Honestly, from the second I started climbing, I just knew intrinsically it was what I was supposed to be doing. It might sound hokey, but sometimes you just find something that sets your soul on fire." That fire hasn't waned in her years at Gonzaga, where her math studies are aimed at eventually going to medical school, and she's managed to balance being part of the school's Honors Program while continuing to compete at climbing's highest levels. She even co-founded Gonzaga's Climbing Club, which has blossomed to the point she sounds genuinely shocked at how many of her fellow students are climbers, too. At last year's collegiate national climbing championship, she won the women's sport-climbing division, in which climbers complete 60 to 70-foot technical climbs. That success inspired her to add speed-climbing (side-by-side races up a climbing wall against another climber) and bouldering (four short, highly technical climbs done in rapid succession) to her competitive slate, a daunting three-fer that requires her to be in insanely good shape. When Tolson returns from Slovakia, she'll look for a summer job like any other college kid, before pushing through her senior year and starting applications to medical school. That doesn't mean climbing will be pushed to the side, though. The 2020 Olympics in Tokyo is having competitive climbing as an exhibition sport for the first time, and Tolson could find herself among the world's top 15 women in the world rankings pretty soon, qualifying her to represent the U.S. The Olympics' move to include climbing seems natural after what Tolson's seen happen to the sport. "Indoor climbing competition has gotten really crazy," Tolson says. "When you think of indoor rock climbing, you think of a stuffy old gym with chalk everywhere. But really, in the last 10 years, there's been this huge shift to this spectator-style climbing. Massive places, really open concept where the walls are almost like a stage. Huge crowds. It's really electric energy." That energy could just take Tolson to Tokyo. But years from now, when she's practicing medicine and no longer competing, she'll still be tackling walls at the gym and on rocks outdoors. The World University Championships take place in Bratislava, Slovakia, June 20-23. The original print version of this article was headlined "Such Great Heights"